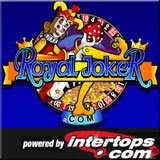 Intertops’ new RoyalJoker.com has already been paying out! The red carpet is out and players can expect the royal treatment – the new RoyalJoker.com casino, operated by industry pioneer Intertops.com, is now online. Only weeks after launching, the new online casino has already had its first big winner. Michael P has just won $92,960 playing the “Break da Bank” slot machine. Although RoyalJoker.com offers a total jackpot pool of nearly $7.5 million, this was a winning wager, not a progressive jackpot win. The winner deposited just $20 and then rode his winning streak to this huge win. RoyalJoker.com is a new online casino presented by Intertops, one of the oldest and most trusted online casino and sportsbook operators. RoyalJoker.com features more than 350 games from Microgaming Systems including the Mega Moolah slot machine whose progressive jackpot is currently at a record-breaking $6.1 Million. New games will be added every month. The “Wild Card” mystery bonus, which awards $200 to a randomly selected player every Monday and Wednesday, continues at the new RoyalJoker.com until April 29th.